Modern model for a folk look: front in light jeans with stars and gold glittery gray jersey back. Quote: "feel wings", gold text. Finishing: Fringes tone Tan and Gold piping. Stripes, peas, Woohoo & trimmings! Low temperatures yet? Wear a spring look with our trendy, fine cotton and jersey scarves. Bright stripes, polka dots, stars, fringes and tassels! Worn on a dress, T-shirt or blouse they accessoirisent outfit all year round. Vary the pleasures and opt for our 100% reversible scarves. 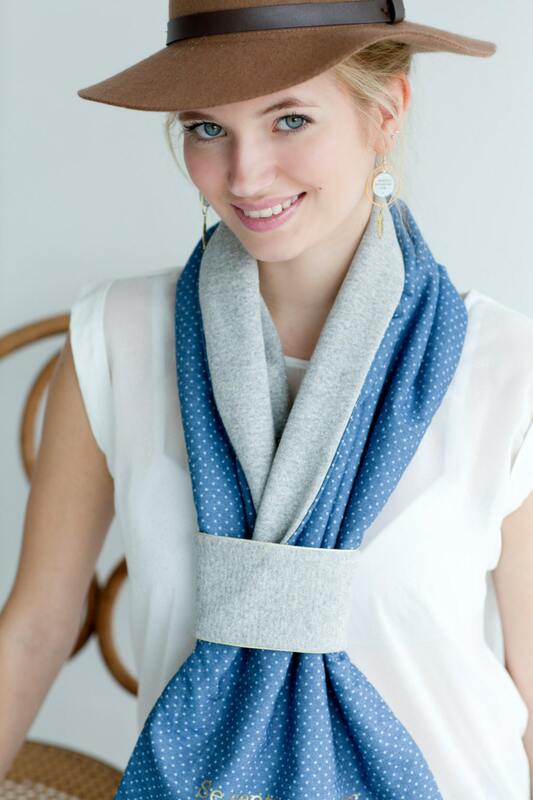 They are made according to our model "tie" which is formed without is put through a loop built into the scarf. Messages on each scarf. 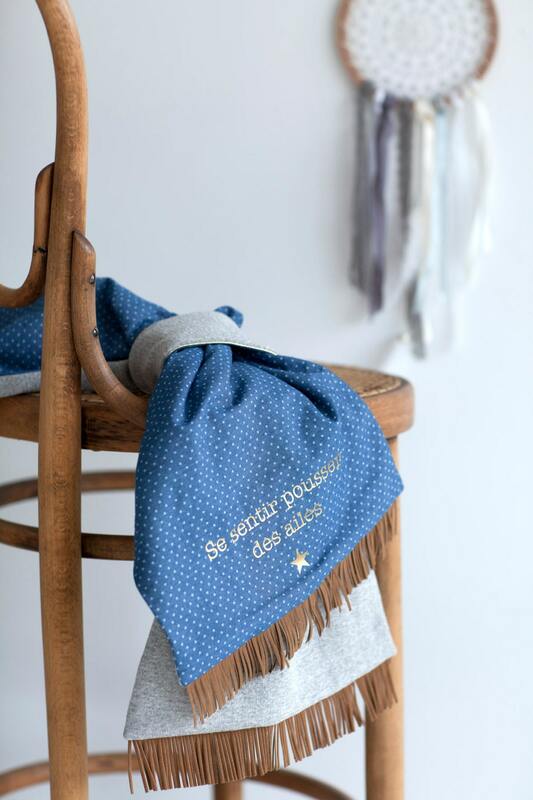 Show your good mood with the quote from YOUPLA now around the neck: I put a smile and I can, stars in the eyes, life is so pretty, feel wings... All scarves are branded by adding a stamped YOUPLA resin disc. 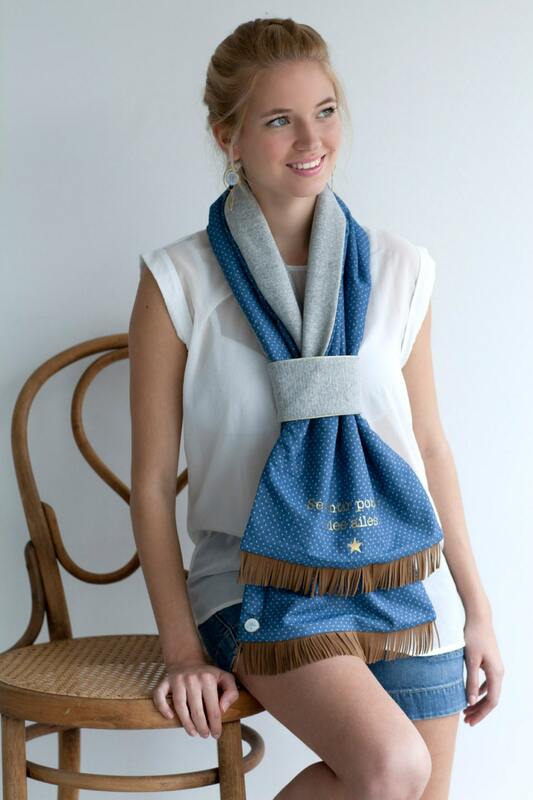 Our scarves are of high quality, fully imagined, designed and made with a smile in Belgium. Each collar is made in limited edition.